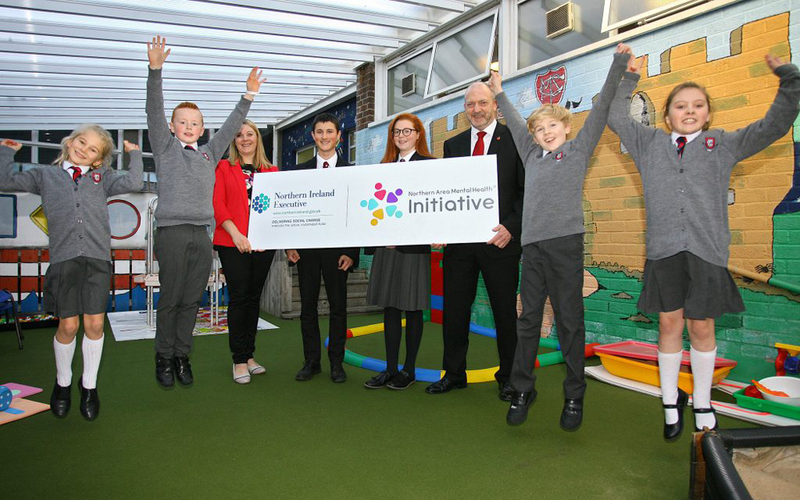 Picture L-R Stuart Crooks, 10, P7; Jaye Pollock, 9, P6; Kieran Mulvenna, principal Carrick Grammar; Dylan Sproule, 12, Y2; Sarah Boyd, 13, Y2; Jennifer Miller, principal, Carrick Model PS; Evie Coates, 9, P5 and Cameron Fitzgerald, 9 P5. 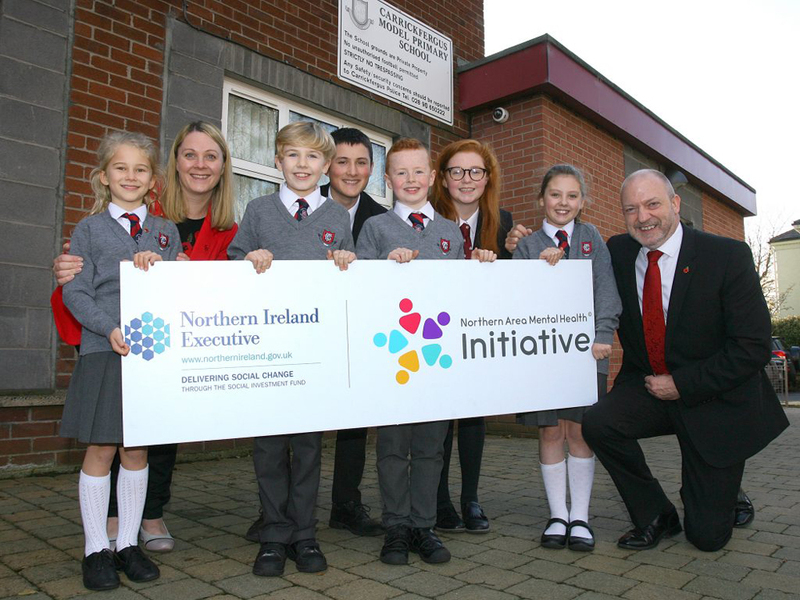 A pioneering new mental health initiative for young people and children as young as eight years of age up to 25 has been unveiled in response to the rising incidence of mental ill health issues among Northern Ireland’s younger generation. 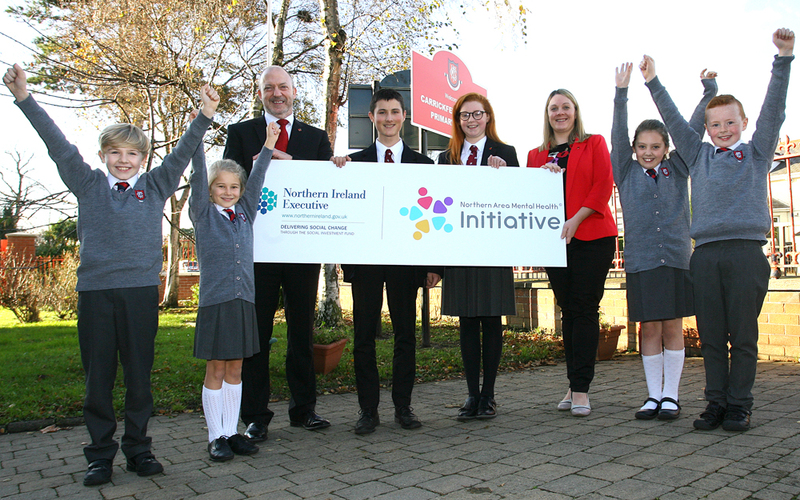 The Northern Area Mental Health Initiative, supported through funding received from the Social Investment Fund under the NI Executive’s Delivering Social Change framework, was launched to equip children and young people with the resilience to handle periods of mental ill health one quarter of them are statistically likely to face. The Northern Area Mental Health Initiative is an innovative and exciting new project led by Cookstown and Western Shores Area Network (CWSAN), in partnership with Action Mental Health and Nexus NI. The Initiative will deliver free mental health awareness and resilience training, internet safety, sexual abuse and exploitation education for almost 6000 young people aged from 8 to 25 in schools, youth clubs and through key contacts. The Initiative is to be funded by SIF for two years, until March 2019, and will be delivered across the Northern Social Investment Zone which broadly mirrors the Northern Health and Social Care Trust boundary. Some 1700 Key Stage 2 children – from 8 to 11 year olds in Primary 5 to 7 will receive the ground-breaking training, while children at post primary level, approximately 2700 pupils aged 11 to 16 in years 8 to 12, will also undergo the programme. The unique training package will also be delivered to some 1380 teenagers from 16 years up to 25 through youthclub groups, parents and carers. Elements of the training will include mental health awareness and resilience training; bespoke resilience workshops – like building resilience to cope with exam stress, self-esteem for the group; and education on sexual abuse and exploitation. This important element will be heavily targeted at the youngest group from 11 to 16, with 3940 of this age demographic participating in this programme. 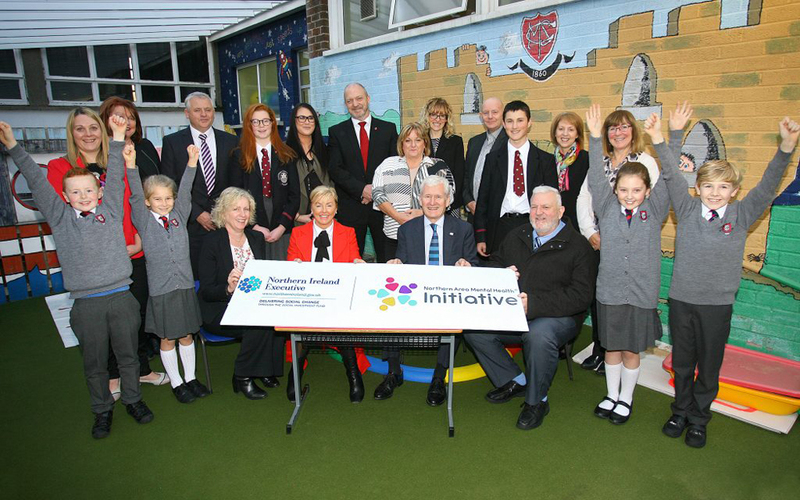 The Initiative will target children and young people living in the Coleraine, Newtownabbey, Carrickfergus, Ballymena, Antrim and Larne areas. “Communities across Northern Ireland are acutely aware of the challenges of mental health. Unfortunately, too many people feel alone in dealing with the harsh reality and impacts of poor mental health. 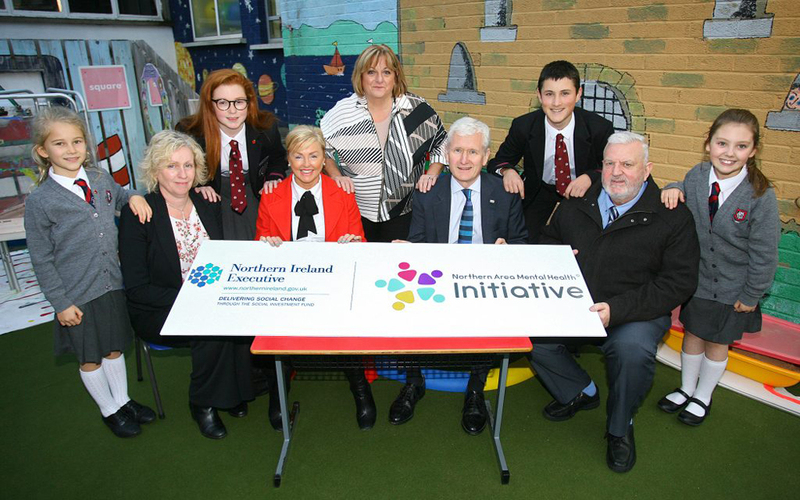 “This important initiative funded by the Social Investment Fund will provide a range of information, support, training and signposting for a range of mental health and wellbeing support services for 8 to 25 year olds,” he added. ‘The current generation of young people are subject to unprecedented stresses which put their mental health, their happiness and their future life chances at greater risk than ever before. “The inescapable pressure of social media, an examination system which is based on relentless assessment, and the resultant lack of personal space in which to process the challenges of growing up in the 21st Century have left our young people more vulnerable to mental health crises than their parents could ever have imagined. 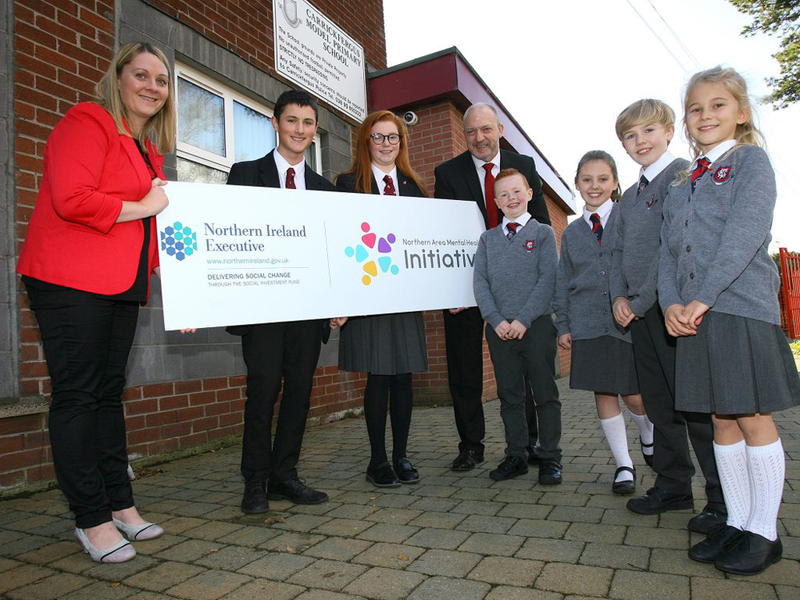 Jennifer Miller, principal Carrick Model, Dylan Sproule, Sarah Boyd, Kieran Mulvenna, principal Carrick Grammar, Cameron Fitzgerald, Evie Coates, Stuart Crooks, Jaye Pollock. Front row – Cameron, Jaye, Siobhan Broderick TEO, Helena, David Babington, William Adamson, Evie and Stuart.